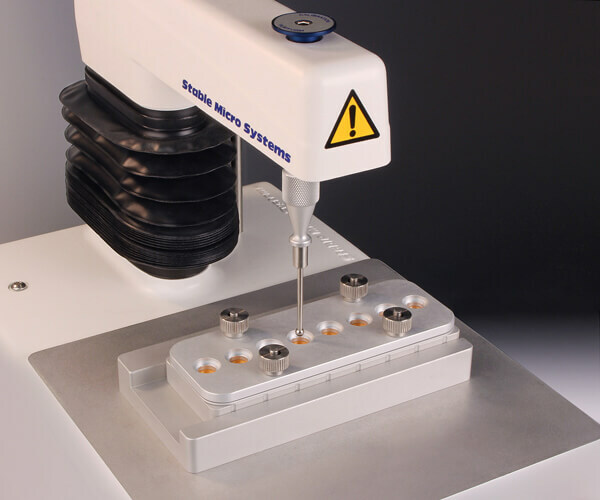 The Multi-head Indexing Probe is another application for the Automated Linear Indexing System that allows adhesives to be tested without manual intervention between tests or the need to clean/dry probes in between sample tests. This thereby allows for ‘walk-away’ time from testing due to the system being able to automatically index to a new probe after each test. The video shown here gives an example of how the Automated Indexing System can operate with this Multi-head Indexing Probe. The Multi-head Indexing Probe is also available separately for those users who just wish to speed up their testing whilst manually indexing the probe to the next clean probe during testing, to avoid stopping to clean and dry between tests. Both ways of using this Multi-head Indexing Probe serve to increase your sample throughput to get your data collected in less time by saving the necessary cleaning to the end of multiple tests. 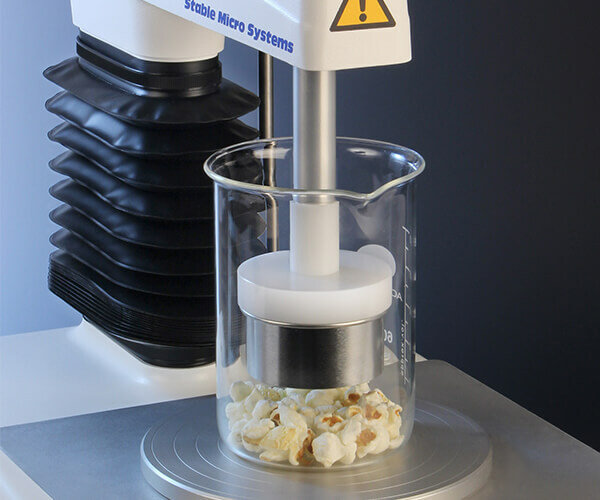 The TTC Spreadability Rig has become one of the most popular rigs used on the Texture Analyser for the measurement of both semi-solid and solid samples. Listening to feedback we have received from users of this rig we have decided to provide the option of a catchment collar to collect the sample that has extruded from the sample pot, thereby making clean-up easier. The collar is in the form of a ring that easily sits around the sample pot and is located at the same height to collect any sample that has overflowed. The ring is quickly removable, ready to place on the next pot, or alternatively made available in sets of 5 for each of the pots that are included with the rig. For users who have the Spreadability Rig already, this attachment can be ordered to improve your existing testing and cleaning regime. Vickers testing has been a very widely-used technique for many materials for decades due to simple data analysis and test preparation. Many applications demand a tip made from a very hard material such as diamond or sapphire, as the indenter must be significantly harder than the material under investigation. However, stainless steel is suitable for testing many softer materials such as tablets, soap, fruit and vegetables, cheese, chocolate and some polymers. Traditionally, Vickers hardness is calculated by inputting the indentation diagonals into a standard formula. However, instrumented indentation on a Texture Analyser allows automatic hardness analysis without the use of a microscope. It also enables other parameters such as stress relaxation and elastic-plastic energy ratios to be calculated. This stainless steel Vickers indenter is designed for fast and repeatable hardness testing of soft materials, such as those often used in the food, pharmaceutical and personal care industries. Shore durometers are used to determine indentation hardness of materials by using a measurement of resistance to deformation. A and D are the two most commonly used scales and have slightly different geometries. These probes are generally used as an empirical test for quality control as well as research and development rather than the investigation of a material’s properties. It is attractive for these purposes as it is a quick test to perform, and the hardness scale is easy to understand (although cannot be equated to other indentation hardness measurements). The majority of Shore hardness testing is carried out on standard and vulcanised rubber, thermoplastic elastomers, gels and plastics. Before measuring any of these materials, it is necessary to refer to Shore reference tables, as some materials are better suited to Shore methods other than A and D.
Exponent software now holds suitable projects ready to test Vickers and Shore Hardness using these probes. Stickiness is a difficult attribute to measure. It can be defined as simply the force of adhesion when two surfaces are contacted with each other. In most materials, the adhesion force is a combination of an adhesive force and a cohesive force. It is when the adhesive force is high and the cohesive force is low that material is perceived as being sticky. This stickiness property can be either a positive (desirable) or negative (undesirable) characteristic of a product but is very much product dependent. Using a Texture Analyser this characteristic can be quantified in order to determine whether the property is within the correct range for the particular product to either function or be consumed according to expectations. 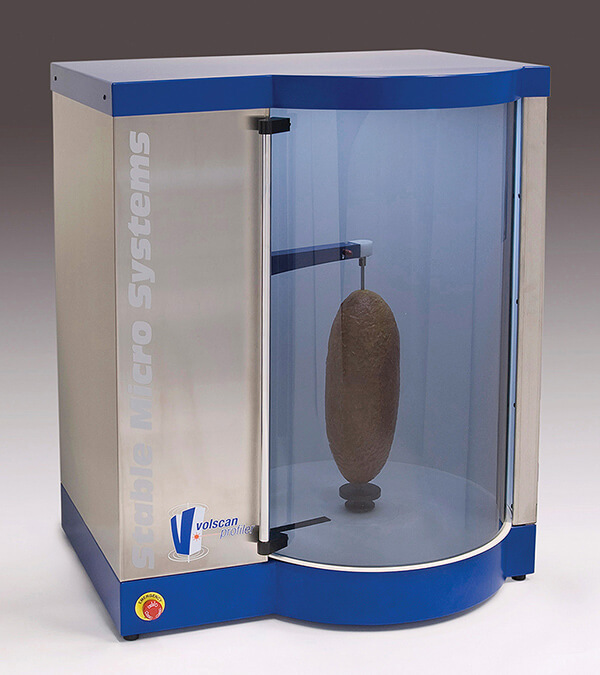 The Warburtons Dough Stickiness Rig has proven very popular as a means of testing the stickiness of dough samples. The Warburtons Rig has two sizes which suit the size of the dough pieces (500g and 1000g) that come off the production line, which is the reason for its current dimensions. However, we have been asked for a similar means of testing smaller samples which may also accommodate semi-solid materials other than dough. The new Mini Stickiness System provides a similar means of testing and is located on the Heavy Duty Platform (which will be required to use this new fixture). To measure adhesive properties, it is imperative to have a clean separation at the probe‐material interface. The fixture consists of a sample testing box into which samples can be placed quickly and a retaining plate is placed on top of the sample, applying slight compression to the sample. A narrow blade is driven through a slot in the retaining plate, to a defined distance. 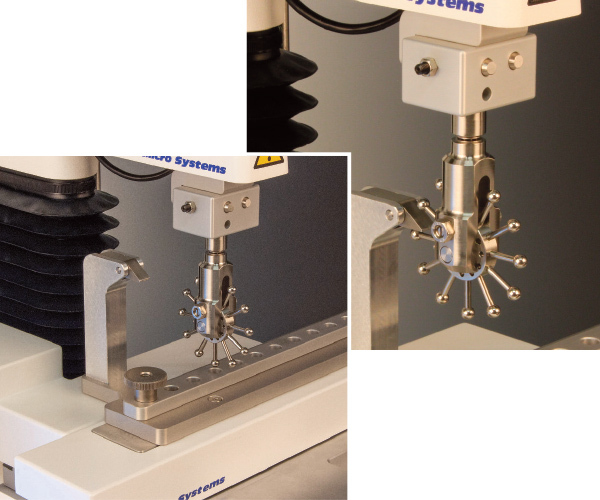 This action provides operators with an accurate assessment of the compression peak and compression area of the sample, indicators of its consistency (firmness / softness). As the blade is withdrawn upwards, Exponent software calculates the adhesion peak and adhesion area. The higher the peak, and/or larger the area, the stickier the sample. This fixture is likely to be popular due to the high speed of the test and the ease of removing the blade for cleaning between tests therefore increasing sample throughput. Users of the Powder Flow Analyser (1) will now be interested to know that we now have split vessels available for the measurement of bulk density, as well as a new probe which attaches to the PFA motor for the measurement of compressibility. Using the split vessel (2), excess powder can now be discarded after the usual two conditioning cycles using the standard PFA blade. This leaves behind a precise volume of powder. Knowing this exact volume, along with the weight of the powder (that the PFA load cell measures), conditioned bulk density can be measured accurately and automatically. 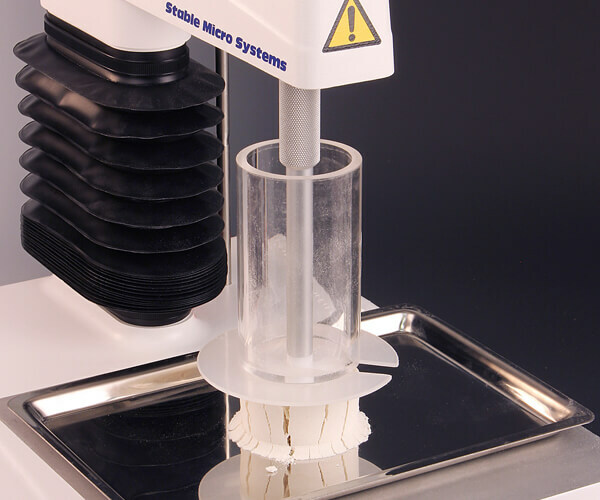 The split vessel adds an extra benefit of a flat pre-compression surface once the extra powder has been discarded and the subsequent testing of volumes of sample that are exactly the same. At this point in the test project, the user is instructed to remove the PFA blade and attach the compressibility probe (3). Once the probe initially reaches the surface of the powder and registers a force of 10g, the “initial bulk density” is recorded. This is equivalent to the Carr Index often used for powder analysis. In general, a more free flowing powder is less compressible (as the powder particles have already flowed into a more close-packed state). This corresponds to a small increase in bulk density with stress and a low compressibility. A more cohesive powder tends to show the opposite behaviour and a high compressibility. Holes are present in the compression probe to allow for air pockets to be released during compression from the underlying powder column. Along with the measurement of Compressibility and Bulk Density additional parameters can also be measured within this test after it has been split into three sections: Stiffness, Relaxation and Elastic Modulus. Current users of the PFA projects will notice that projects in Exponent have now been included to measure compressibility and existing projects updated to include the measurement of bulk density when using the split vessel, as shown opposite (4,5). To optimise 'walk away time' from the PFA, you may wish to use a new project that ties all three standard PFA tests together (cohesion, PFSD and caking) and runs them sequentially on the sample – this new project is called ‘Three PFA Tests in One’ (6). This is now included in the sample PFA projects; it is not advisable on a sample that is likely to have a high degree of segregation or attrition, but may otherwise be found useful on many samples if sample quantity and test time are limited. It is highly recommended that the help file for each test is studied before performing the sequential test, so there is a good understanding of what each test does. The project is set up to perform tests in order with cohesion first, followed by PFSD then caking. This order has been chosen so the least destructive tests are performed before the most destructive (caking) so the tests are most representative of using a new sample each time. We hope you will find these new processes useful. Anyone who has handled powders has almost certainly come across a clogged hopper, and will know that this is caused by caking, arching or rat-holing. 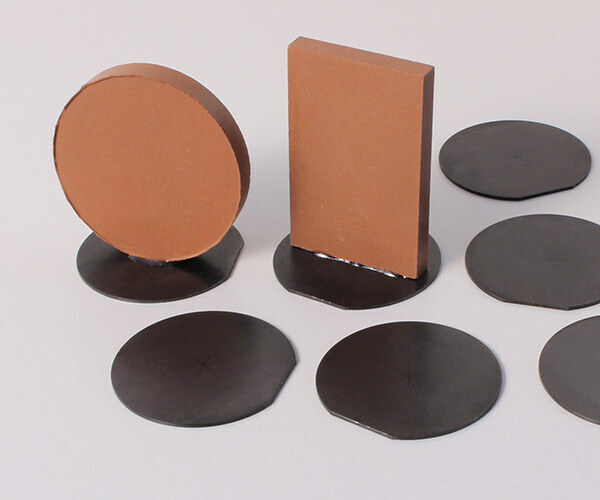 To measure the tendency of a powder to show these properties, the main property to consider is the powder’s bulk resistance to the initiation of flow. This helps to imitate the consolidation that occurs under the powder’s own weight when the outlet is shut and the feeder is switched off. It is when the outlet is opened and the feeder started again that the blockages can build up. The likelihood of a blockage forming depends on both the properties of the powder and the conditions surrounding it (humidity, temperature, stress state, hopper geometry). A vertical shear test provides a method to test the commencement of flow of a powder from a packed state, imitating a filled hopper. This test can also help to determine the correct hopper outlet size for reliable flow. 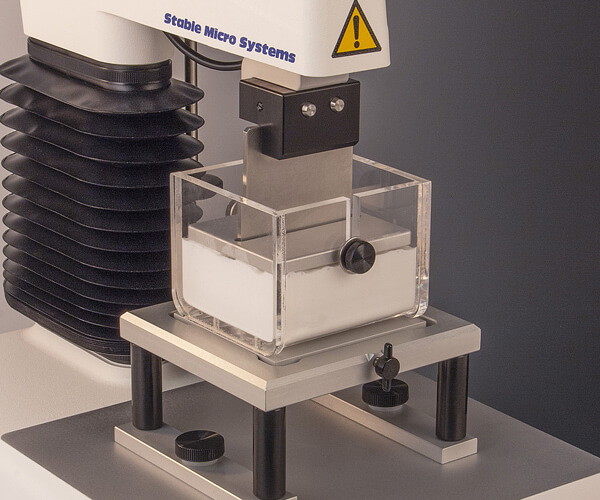 The Powder Vertical Shear Rig is now available as yet another application that can be performed on powder samples using the Texture Analyser. During the test, a known mass of powder is transferred to the main body of the rig and compressed to a known force to create a uniform cake of powder. A trapdoor below the powder cake is released, exposing a circular surface of the cake. A probe slightly smaller than the hole then pushes a plug of the powder cake through the bottom of the rig. The powder is put into an almost perfect shear state (where the force is parallel with the powder movement). This Community Registered Design offers a unique means of consolidating the powder, removing the applied force and testing the resulting sample without disruption by user handling. Using a special sequence and macro created in Exponent software, which guides the user through the procedure, the important parameter of ‘vertical shear strength’ is automatically calculated once tests are complete. We have identified a requirement for powder compaction testing at lower compaction forces than the existing methods – which require a TA.HDplus Texture Analyser. 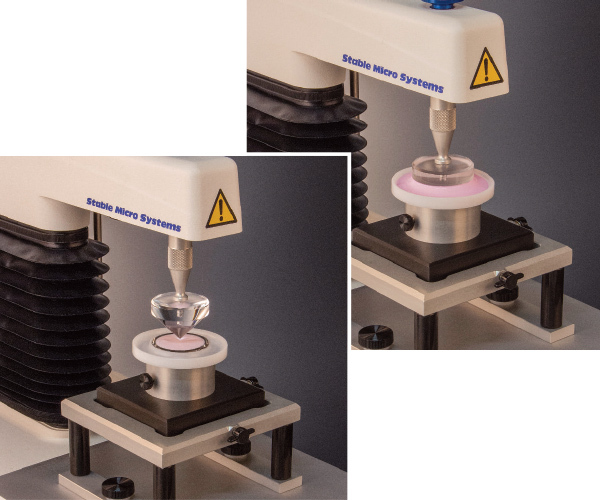 To meet this need, two low force powder compaction fixtures – providing indexable testing of 10 samples up to 50kg (A/IPC0.5) and 10kg (A/IPC5) – have been developed, which also serve to increase useability and efficiency. Once the first sample is centralised with the testing probe, subsequent samples can simply be moved along via a ‘quick-click’ mechanism which aligns the next test ready to go, therefore increasing sample throughput. Compaction properties of powders can be assessed using target force or target distance modes. Many powder compacts are formed to a target distance and so the Powder Compaction Rigs can be used to assess required force. New advances in tabletting machines allow compression to a target force resulting in powder compacts with constant porosity. 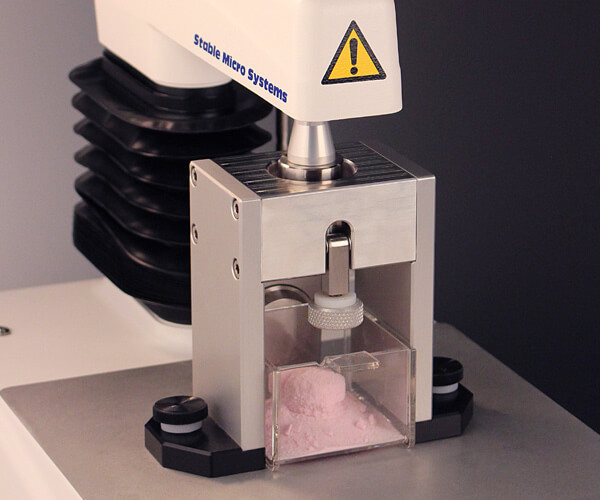 The Indexable Powder Compaction Rig can be used with target force mode to assess the effect of fill level/weight on tablet thickness. In addition, by looking at the loading, hold, and unloading periods of a hold until time graph the information on compressibility, relaxation, stiffness and elastic recovery can be calculated. Many years ago we introduced the Film Support Rig, which was developed as a test for measuring the resilience of thin, film-like products. The Film Support Rig is used in conjunction with the TA.XTplus texture analyser to measure the burst strength and resilience of a variety of personal care and pharmaceutical products including oral hygiene strips, plasters, bandages, polymer film, micropore tape, synthetic skin and latex, amongst other ‘Edible Film’ applications finding their way into the food industry. By way of increasing useability and efficiency, we are now introducing the Indexable Film Support Rig, which allows the setup of multiple film samples ready for testing. Once the first sample is centralised with the testing probe, subsequent samples can simply be moved along via a ‘quick-click’ mechanism which aligns the next test ready to go, thereby increasing sample throughput. The resilience and relaxation properties of the product can also be measured. Resilience can be assessed by depressing the film surface to a chosen distance before retracting the ball probe. The property is calculated using a ratio of the work of compression and work of withdrawal. Similarly, relaxation can be measured with the addition of a hold period within the test to allow the product’s recovery to be evaluated. Both these properties broaden the application of the Film Support Rig. Burst strength, resilience and relaxation are important factors in determining the mechanical properties of a product, allowing manufacturers to optimise product structure and formulation. Using the new Indexable Film Support Rig, film manufacturers can improve the speed that they assess the mechanical properties of their products during packaging and handling, ensuring that they are adequately robust. A protective screen is sometimes a necessary accessory to protect the operator in the event of sample fragments leaving the test area during a test. A Safety Screen is now available for operator protection from such fragments or violent failures of specimens such as hard and brittle materials that may shatter or create projectiles upon failure. In addition, there are instruments used by multiple and/or unskilled operators that may prefer the installation of such a screen for an extra degree of operator safety. The screen is constructed of a strong yet lightweight acrylic panel which allows clear observation during a test whilst minimising weight. A handle at the front of the instrument provides the means to lift the screen. An interlock mechanism requires that the screen is at its lowest ‘closed’ position prior to starting a test and will interrupt the test in the event that the screen is lifted up during a test. Upon lifting, any test that is underway will immediately stop and an audible signal will be produced. The screen has dampers which enable the panel to remain at any lifted position without dropping down. The design is such that the screen works within the existing footprint of the Texture Analyser with no additional bench space required. We are happy to inform you that it is, in fact, the only Texture Analyser that currently has safety in mind! With the VolScan Profiler, manufacturers have a precise and fast method for the measurement of volume and density of uniform and non-uniform solid products, in order to be able to routinely characterise the structure and quality of solid materials. For customers who are looking for ways to support solid materials, or types of products, that cannot be supported by our current array of spikes using the Standard Product Support or Universal Product Support, we have a new innovative option. Users can now choose to have an additional alternative product support which accommodates circular disposable inserts magnetically. These provide the means to ‘adhere’ their sample to the insert and allow for quick removal and replacement between tests. Disposable inserts are provided in batches of 50 and may or may not be reusable, according to the chosen adhesive for sample anchoring. There is now a new method for measuring Unconfined Yield Strength of Powder, using your existing Texture Analyser. In industries that handle powders on a regular basis, it is very important to understand how a powder or granular material responds to pressure. In storage, the weight of powder in a container exerts pressure on the particles at the bottom. If the powder has good flow behaviour, it will not consolidate and will flow out of the silo or hopper without sticking – this is very desirable. Unconfined Yield Stress is a simple technique that can be used to analyse the flow behaviour of many different types of powders and the change in this behaviour with different consolidation stresses and times. The measurement is made by filling a chosen weight of powder sample into a tube and using a compression piston which applies a chosen consolidation force for a specified time. After consolidation, the tube is slid upwards above the consolidation probe and held up via a support disc, before the probe moves back down to compress the freestanding column of powder which “yields”. Formulae are built into Exponent software which are able to collect the required parameters and calculate the Unconfined Yield Stress which then allows a “flow factor” to be plotted and used to compare between samples. The larger the flow factor, the more easily the powder will flow after any given consolidation pressure. This assessment of powder characteristics is yet another measurement that the Texture Analyser can perform on powdered materials, alongside the functionality offered by the Powder Flow Analyser. 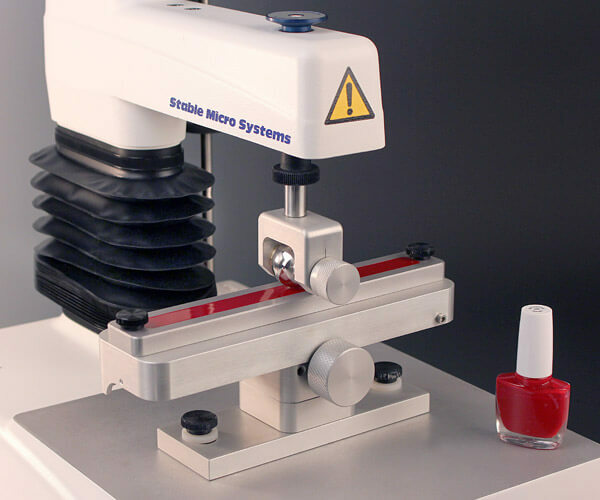 A Nail Polish Adhesion Rig and method have been developed by Stable Micro Systems to provide the solution to this assessment requirement. During the polish drying time test, a channel 20cm long is filled with polish to a depth of 0.5 mm and wiped level using a glass rod. At this point a timer within the Exponent software test sequence is started. This channel is seated on top of the Adhesive Indexing System that has ten detents and so ten test sites are available by simply sliding the platform along. A 1 inch detented ball probe* is used for the tests, which can be turned to allow a clean test site without either replacing the probe or the requirement to clean and dry the probe between tests. This is used to perform an adhesive test at the first test site. A specific force is held for 5 seconds to allow a bond to form. The probe is then quickly withdrawn, breaking the nail polish bonds, and the force to do this is measured. The channel is moved along to the next site and the test repeated. A set of ten tests are performed in this way with pre-set time delays between the tests. Tests are performed over the whole drying period of the polish. 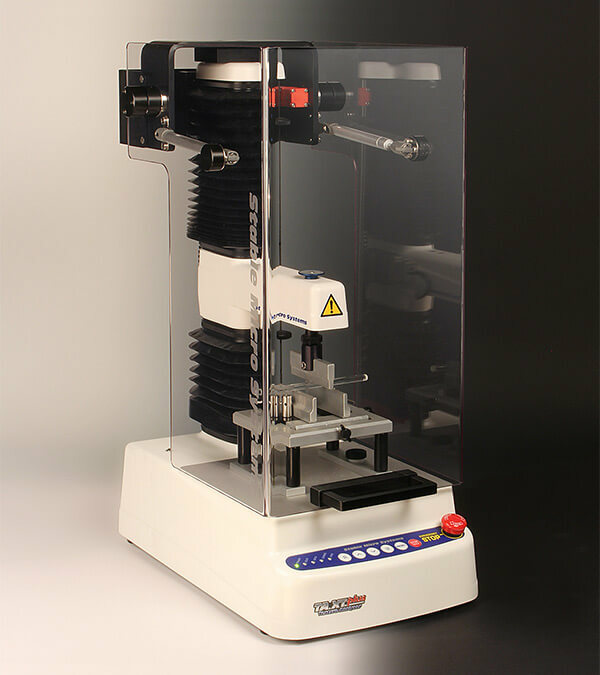 The series of adhesion tests is automated by a unique test sequence developed in Exponent software, with parameters such as the delay between tests, the number of repeats, applied force and holding time adjusted by the user if necessary. Additionally, an analysis macro is available to measure the above four properties across all repeats at the press of a button. With the addition of instruction messages in the sequence this provides a user-friendly solution for this type of product testing. Henk Mulder, physical scientist at Zeelandia, commented, “Stable Micro Systems’ equipment is extremely accurate and versatile. Manual tests, and even our previous lab testing methods, didn’t give us enough detail to draw meaningful conclusions for our NPD or quality control purposes. 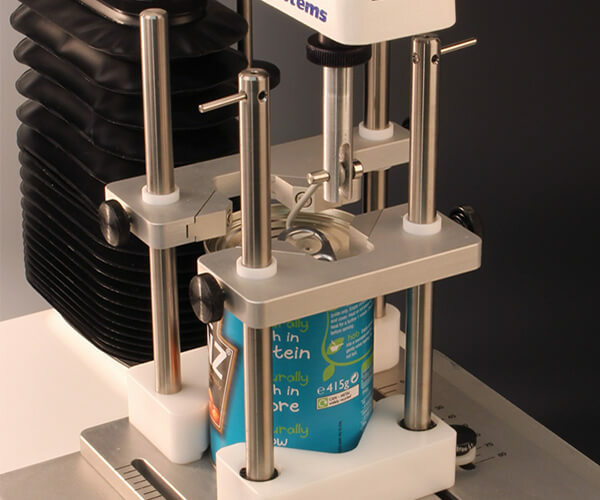 The ‘V’ Squeeze test measures valuable parameters, but recording sound using the Acoustic Envelope Detector provides far more detailed results that can be used in new product development and for competitor analysis and QC purposes”. 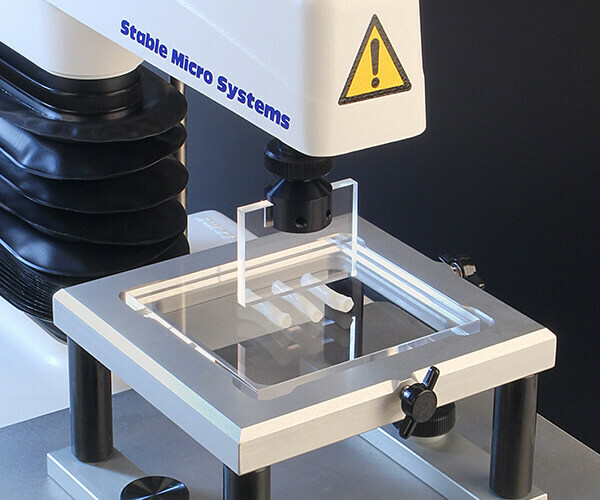 Stable Micro Systems has once again extended its range of Texture Analysers and presented a single column instrument capable of measuring force up to 100kg. The addition of the TA.XTplus100 model also offers an improved distance resolution which is doubled to 0.0005mm. This capability will be of major interest to those (particularly in the pharmaceutical industry) who require fine distance control/ measurement of, for example, small granules/beads/particles. • More capacity for the same laboratory bench space (footprint). • The ability to use those attachments – e.g. 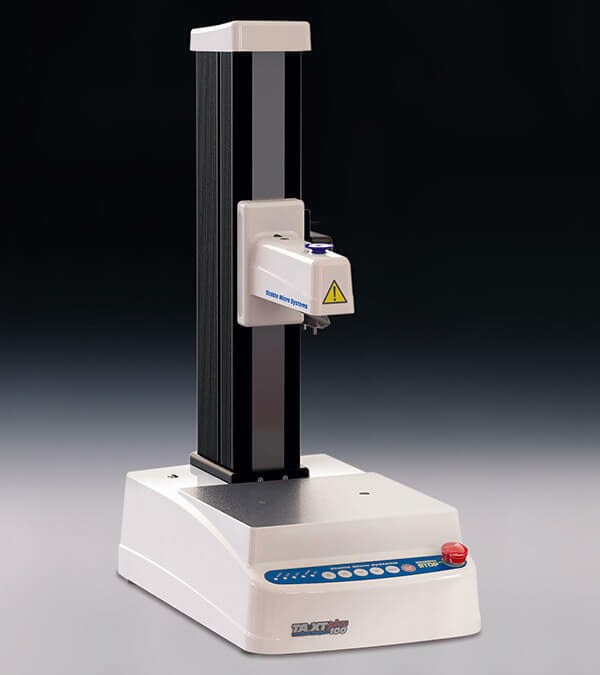 Ottawa Cell, Kramer Shear Cell – that usually require the high force capacity of a TA.HDplus. • An extended height model option at this 100kg capacity to provide more testing distance for high force extensional applications. • More location points for the attachment of accessories such as temperature devices, lights, humidity probe, cameras etc. A new rig has been developed to allow manufacturers of food tins and beverage cans to measure the force needed to lift the ring pull and open the container. This new development could signal the end of consumer frustration with trying to open metal packaging that is too stiff, or where the ring pull detaches from the lid. Understanding and quantifying the force needed to use a ring pull is vital for both packaging manufacturers and their customers to ensure safety, functionality and consumer experience. The force required to open tins and cans is dictated by the shape of the ring pull and lid, their materials and the depth of the groove in the lid. Until now, only subjective methods were available for assessing ‘force to pull’, which made it difficult to identify the design that provided both ease of use and packaging integrity. The rig works by locking the product in place on the TA.XTplus texture analyser and attaching a hook adapter to its ring pull. The hook is pulled upwards, mimicking the action of a person opening the can, while measuring the force needed to lift the ring pull and finally break the seal. The universal design of the Ring Pull Rig means non-circular shapes, such as meat or fish cans, can also be accurately analysed. The flexibility of Exponent software has also allowed the development of a special test for tins that require a two-step pulling action. The rig first measures the force needed to break the seal before pausing and allowing the user to adjust the hook direction or rotate the tin. The second part of the test then measures the force required to peel and remove the metal lid completely. Extensive work has been carried out at the Wheat Marketing Center in Oregon, USA by Gary Hou and his team. They use a particular type of perspex blade on their TA.XTplus Texture Analyser to measure noodle firmness which has now become internationally popular and therefore has been included in the Stable Micro Systems probe and fixture range. There are few people in the world who know as much about noodles as Gary Hou of the Wheat Marketing Center. In addition to the hands-on short courses that he offers through the Wheat Marketing Center, he is also editor of 'Asian Noodles: Science, Technology and Processing'. For texture analyser users who are looking for ways to increase their sample testing throughput and improve the convenience of probe attachment to their texture analyser, we now have two innovative options. Users can now choose to have a converter fitted to their probes to allow for quick removal and replacement between tests. Either a ‘magnetic’ coupling or ‘quick-twist’ attachment for the probe is available (in batches of 5). These quick probe removal and replacement options are the first of their kind in texture analysis and support the need for test procedures that have efficiency and/or convenience in mind. Whilst a magnetic coupling might be the favoured attachment action it is not suited to the testing of samples that do not have a flat surface or samples that have an adhesive force measurement exceeding 1.5kg. The ‘quick-twist’ probe attachment is suited to all applications and load cells. These have Community Design Registration – proving our commitment to new innovation testing solutions. Bulk testing can now be performed with a Triple Ring Cutting System which allows the determination of the textural properties of small non-uniform samples in smaller quantities. 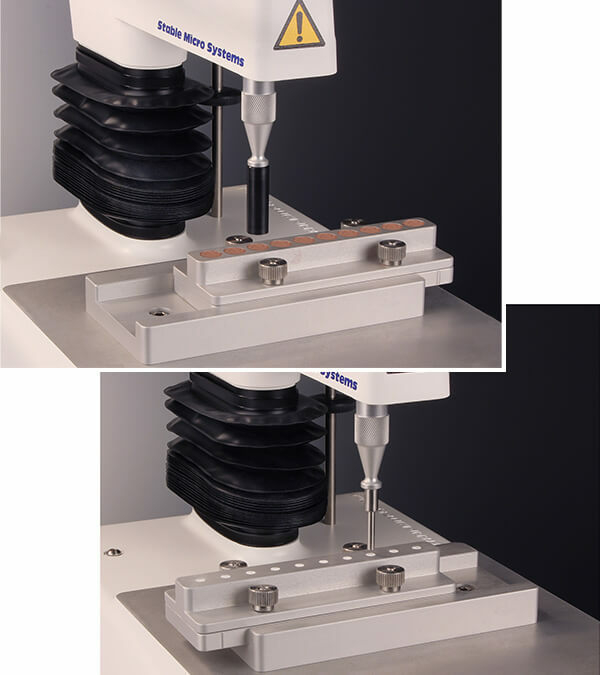 The design of the test head is based around a cutting array of concentric rings which provides a large cutting surface area in a relatively small device. 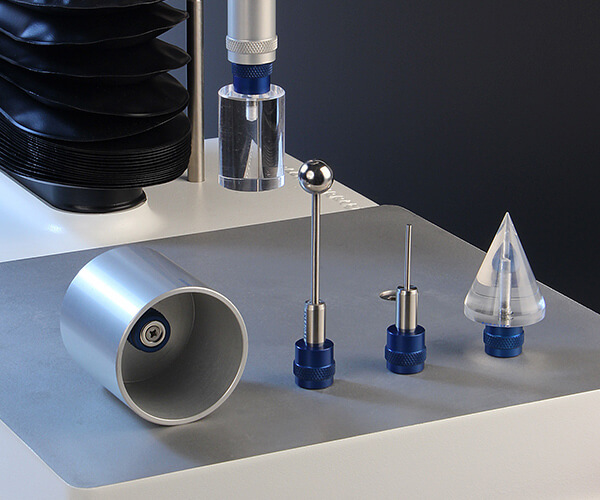 This enables the testing of a monolayer of sample in a 95mm diameter vessel – a suitable choice to contain the sample to an optimum depth for cutting. The concentric rings cut into the sample during a test (to a chosen distance above the vessel base) and force the sample to breakdown whereby the force during this procedure is gathered. The higher the maximum force and area under the curve the firmer is the sample which would be perceived by the consumer upon eating. A centralising platform ensures the test vessel can be quickly located in the ideal test position whilst a magnetic coupling of the test head allows for quick removal and replacement between tests for cleaning. 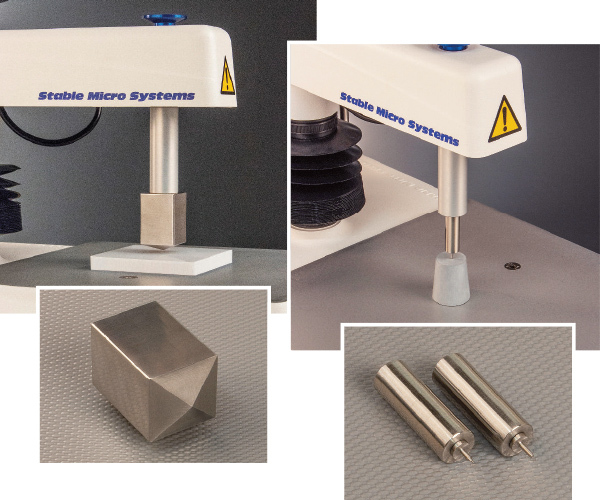 This magnetic quick removal system is the first of its kind in texture analysis and supports the need for test procedures that have efficiency in mind. The Cutting rings on the device are also removable for easy cleaning once all tests are complete. The Triple Ring Cutting System is a Community Registered Design and is a continuation of the ever increasing range of innovative solutions for texture analysis. At the 100th AACC Conference in Minneapolis in October 2015, the VolScan Profiler was awarded the Certificate of Approval as a Standard Method with reference 10-16.01. This is good news for all operators in the cereal science and bakery product testing world who are encouraged by (or have greater preference for) methods that are approved by the AACC. The Method was taken through a collaborative study with 9 other laboratories in 4 countries who followed the procedure and reported their results from the measurement of the same samples. The measurement of Volume, Length, Height and Width are all part of the Standard Method, making it the method with more scope in parameters and breadth of bakery samples than any similar method using competitive equipment. The VolScan Profiler has also reported results that are more accurate and repeatable than any other volume measuring instrument.